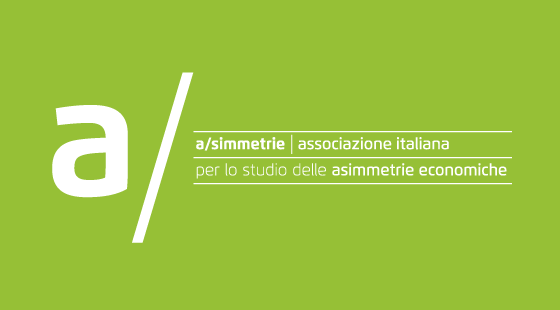 a/simmetrie – Italian association for the study of economic asymmetries, is a non-profit organisation devoted to the study of economic asymmetries. These asymmetries are analysed both in their economic nature (for instance, by considering the relations between subjects with different market power or information set, or the relations between countries of different size and institutions), and in their political and juridical implications (for instance, by analysing the relationship between economic policy and inequality, or by studying effects of determined by the adoption of asymmetric policy rules). The Eurozone crisis has brought to the fore the theme of economic asymmetries (between the manufacturing and financial structures of different member countries, between national and supranational policy rules, and so on). The study of the Eurozone crisis, therefore, is an important, but not exclusive, research field for a/simmetrie. At a more general level, a/simmetrie intends to intervene in the public debate, by producing original research pieces focusing on economic asymmetries, and by disseminating their content to the general public, in order to contribute to a more critical and informed public opinion, and to the more balanced development of social and political reflection on these issues. To this purpose, the association organises workshops and conferences, funds research programmes, publishes original research, supports projects aimed at the diffusion of economic culture, favours networking between researchers coming from different countries and fields, and encourages their involvement in a joint reflection on the possible paths towards a balanced and sustained economic development for the XXI century. The association publishes a on-line working paper series in order to disseminate the preliminary versions of researches carried out by its researchers, or presented at the events organised by a/simmetrie. The series is open to the contributions of any scholar in terested in the field of economic asymmetries. The working papers can be submitted by sending them at info@asimmetrie.org.